The best part of a new brewery is never the beer. No, it’s the 100 bottles of whiskey and the long counter of hot brisket, pulled pork and beer-braised collard greens. And also sometimes it’s the beer. 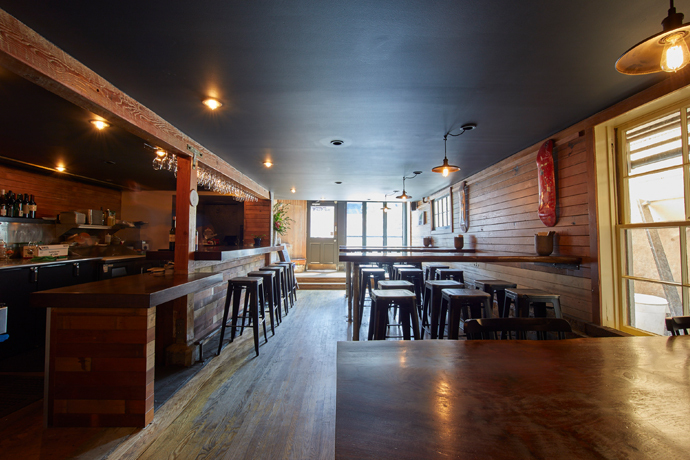 All those things happen at Smokestack, the massive brewery outpost of the Haight’s beloved Magnolia Brewing Company—it’s also a barbecue joint and a whiskey bar, because why not—opening soon in Dogpatch. You know beer. So you probably know Magnolia—that basement brewery on Haight. Nothing against basements, but... Wow. This is not that. With towering ceilings, casement windows, exposed pipes and beat-up wood, it feels like an old factory devoted to making only the good stuff. Come on in whenever. Have a quick beer at the bar to the left. Or lunch from the counter to the right, filled with all sorts of barbecue (think brisket and pork, sure, but also Thai Chili Cheddar Pork Sausage) that you order by the pound. Or dinner from that same counter. And beer. Right. There’s lots of whiskey and lots of beer. The brewery’s in the back, and it exists to fill 20 taps (and three hand pumps) with, say, Proving Ground IPA and Old Thunderpussy Barleywine, served at either 42, 48 or 55 degrees. Whatever the beer needs to best fulfill its noble destiny.